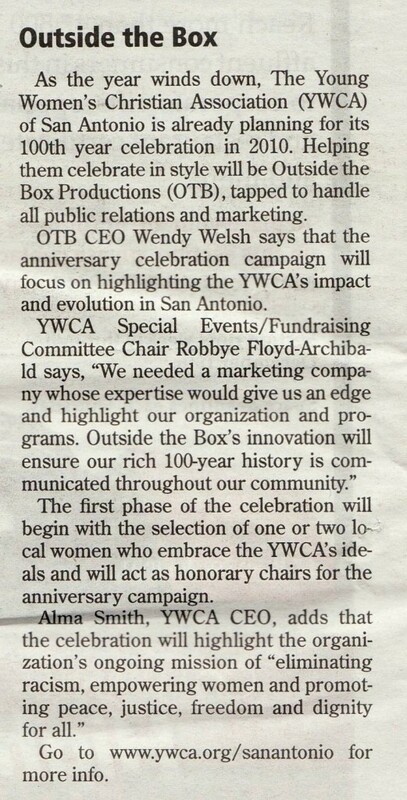 The partnership between the YWCA of San Antonio and Outside the Box Productions is featured in the November 7th edition of the San Antonio Business Journal. Check out the Marketing & Media section! This entry was posted on Thursday, November 19th, 2009 at 7:22 pm	and is filed under Buzz. You can follow any responses to this entry through the RSS 2.0 feed. You can leave a response, or trackback from your own site.